What'cha workin' on Wednesday?!? . . . and a 'pop-up shop'! It's another Wednesday and another opportunity to share with you all of the inspirational restyles being done by our awesome customers! We first met Beth at the Home, Garden and Decor show and then again recently when she attended one of our van Gogh workshops. In the midst of selling her home and buying a new house, Beth took on the project of restyling her bedside tables, headboard and a mirror. The colour choices are very classy and I love how she has created a two tone effect by painting out the cutouts and drawer fronts in a different colour. Great job Beth! . . . 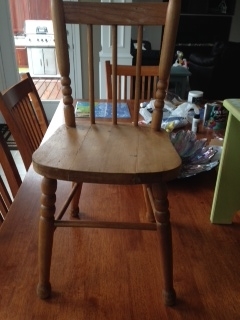 I only wish you had some 'before' pictures to share! Sweet, bubbly Laurel also attended one of our workshops and promptly went home to restyle this little end table. I'm sure this won't be the last of her projects because she was just in recently to buy some more paint! Love it Laurel! Courtney has been at it again! This time she restyled these two console tables using van Gogh's 'river tides'. Ooh - looks like the second table also got two new crystal knobs from Mango Reclaimed! They look great Courtney! 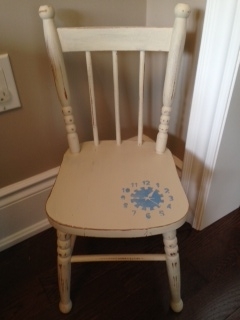 Last, but certainly not least is this sweet little child's 'time out' chair that was restyled by Lindsey. Great idea and great stencil Lindsey! Thanks for sharing! Thank you, thank you, thank you for allowing me to tag along on your creative journey! If you have restyled something in your home using products from Mango Reclaimed and want to be featured on What'cha workin' on Wednesday?! ?, e-mail your before and after pictures to melanie@mangoreclaimed.com. Looking forward to hearing from you! Don't forget to stop by and see us downtown Whitby at 118 Brock Street this Thursday from 6 - 9pm! Mango Reclaimed and The Inspiration Nest will be running our first ever 'pop-up-shop' as part of the downtown shopping event. Shop Local / Shop Late!